The spring time is the perfect time to pull out those flip-flops and bathing suit and plan the perfect warm-weather escape to sunny Carmel, CA. Whether you are looking for the perfect spring break adventure or just a weekend respite, enjoy all that springtime on the Monterey coast has to offer. Experience lush and blossoming hiking trails, romantic evening beach bonfires under the stars, charming boutiques in whimsical Carmel-by-the-Sea and picturesque clifftop drives. Spring is certainly in the air at Best Western Carmel, where you'll earn 30% off your weekend stay if you book your spring getaway with us. The warm weather is calling. Can you feel it? Call the hotel directly at 831-624-1261 to book this package. Offer is not available online and must be booked through phone. Online rates DO NOT include aquarium or whale watching ticket. Restrictions apply. Offer valid based on availability. Not available on holidays or on specials events days. The World's Largest Hotel Chain®. Each Best Western® branded hotel is independently owned and operated. 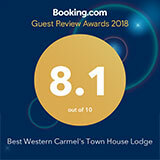 ©2002-2018 Best Western International, Inc. All rights reserved.